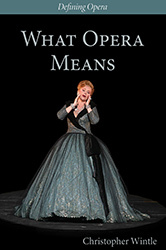 Plumbago Books and Arts is pleased to announce the launch of What Opera Means, the third in its series ‘Defining Opera’. It will be held on 20 March 2018, at the Austrian Cultural Forum in Knightsbridge (London). The book is by Christopher Wintle, Director of Plumbago Books and an (emeritus) member of the Music Department of King’s College London, and edited by Kate Hopkins, content producer for opera at The Royal Opera. It is available in both hardback (£45) and paperback (£15.99) from the distributor, Boydell and Brewer Ltd. The launch will include a performance of the closing scene from Richard Strauss’ Capriccio by Anita Watson (formerly a Jette Parker Young Artist at the Royal Opera) and David Syrus (formerly Head of Music at The Royal Opera). What Opera Means mounts a searching enquiry into the elusive character of opera. Arguing that any art-work can be grasped primarily through its constellation of Platonic ideas, or ‘categories’, the author explores several of these in light of a novel definition of the medium of opera. He elaborates each category with case-studies rooted in the time, place and circumstance of a work’s origin. Although they look back to the infancy of opera, most of the case-studies focus on the relative moderns – Wagner, Verdi, Strauss and Britten; those included under ‘Psychology’ show the benefit of a long-standing involvement with psychoanalysis; and those under ‘Performance’ reinforce the author’s view of opera as a branch of rhetoric. As the first of a two-volume project, What Opera Means deals with categories accessible to all: of fifty entries, only two require basic music knowledge (the second volume will be for specialists). It is suitable for college courses as well as for the general reader. Plumbago Books and Arts is a small, not-for-profit award-winning academic press launched in London in 2000 to publish and promote writings and events in music and the arts that might otherwise have no outlet. It takes its name from the plant that grows in the wild across Europe and elsewhere but in Britain needs to be protected from the cruel frost of the climate. Its logo was designed by Mary Fedden OBE, RA after the characteristic blue flower of the plumbago capensis. The company is based in Clapham Old Town in South West London with its technical support in Oxford. Its books are distributed internationally by Boydell & Brewer Ltd. from Woodbridge, Suffolk, and its main printer is the MPG Books Group of King’s Lynn, Norfolk. It has received financial support from The Hans Keller Trust, The Cosman Keller Art and Music Trust, King’s College London, the Institute of Advanced Musical Studies (KCL), the Faculty of Music of Cambridge University, the Britten Estate Ltd., The Jewish Music Institute (SOAS) in conjunction with the Millennium Award scheme funded by the National Lottery, The William Alwyn Foundation, The William Scott Foundation and private donors. Its books are scrupulously refereed and are regularly reviewed in leading journals. In its first decade, Plumbago Books has developed three strands: The Hans Keller Archive, The Poetics of Music and a General List. The Hans Keller Archive is part of the publishing outlet for a project to assemble in book form the principal writings of the well-known and influential Austrian émigré Hans Keller (1919-85); the editorial office is at King’s College London (where the Director is currently a Senior Research Fellow) and many of the publications are supported by the Cosman Keller Art and Music Trust (of which the Director is a Board Member). Plumbago Books is responsible for four titles: The Jerusalem Diary: Music, Society and Politics, 1977 and 1979 (with drawings by Milein Cosman) (2001); Music and Psychology: From Vienna to London, 1939-52 (2003); Film Music and Beyond: Writings on Music and the Screen, 1946-59 (2006); and Alison Garnham’s account of Hans Keller and Internment: The Development of an Émigré Musician, 1938-48 (2011). The Jerusalem Diary won the Royal Philharmonic Society Book of the Year Prize for 2001: Joan Sutherland presented the award to Milein Cosman during the Society’s annual dinner at the Dorchester Hotel, London on 8 May 2002. The Poetics of Music series is an attempt to map out a modern equivalent to the ars poeticus (Horace), the artistic instruction of the ancients, with wilfully heterogeneous volumes by composers, critics, scholars, performers, analysts and others. The first four volumes show how its repertory is drawn from music new and old: Julian Littlewood’s The Variations of Johannes Brahms (2004, with an introduction by Alexander Goehr), Hugh Wood’s Staking Out the Territory and Other Writings on Music (2007, with an introduction by Bayan Northcott), Bayan Northcott’s The Way We Listen Now and Other Writings on Music (2009), Christopher Wintle’s All the Gods: Benjamin Britten’s Night-piece in Context (2006) and Metapoetics: Aphorisms, Thoughts and Maxims on Life, Art and Music (2010). The General List has opened with a book by Leo Black, a member of Hans Keller’s circle, BBC Music in the Glock Era and After: A Memoir (2010). From the outset, Plumbago Arts has consistently supported small projects, events and concerts in London. Most recently it published a 2010 calendar of Dancers by Milein Cosman on behalf of the Cosman Keller Art and Music Trust; on 24 April 2010 it contributed to an evening devoted to the pianist, teacher and former BBC employee Paul Hamburger at the Austrian Cultural Forum (Knightsbridge); and it continues to supply King’s College London with A3-size ‘Schenker’ manuscript paper.